The “Lower Case” key appears in the upper right corner. The “Upper Case” key is missing, and should be in the lower left corner. Early versions of the Remington Standard No. 2 feature “Upper Case” and “Lower Case” keys, instead of the more traditional “Shift” and “Shift Lock” functions. 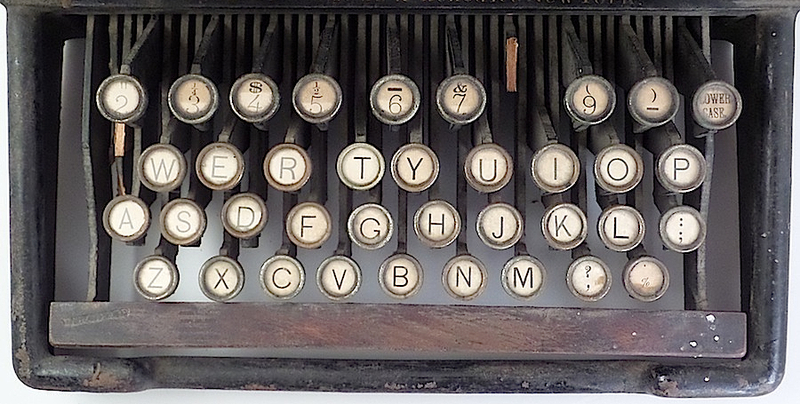 I first noticed this when I acquired my 1889 machine (see here) and questioned the operation of these keys — my unit is not operational and is missing the “Upper Case” key (see image above). My first thought was that upper case was the default mode; after all, the first Remington model, a Sholes & Glidden machine, typed only in upper case. This, however, did not make sense, as people were accustomed to writing in upper and lower case, with lower case as the dominant mode. My second thought was that the No. 2 lacks a default mode entirely, that one simply switches from upper to lower case and back again. In other words, the typewriter is always “locked” in one mode or the other. That, apparently, is the case. A PDF of the full manual is offered here by Machines of Loving Grace. Oddly, instructions for the case keys and the shifting cylinder are on different pages, separated by an intervening page. The placement of the “Lower Case” key is inconvenient, being situated in the upper right corner. The “Upper Case” key is better positioned and will become standard (but, as the “Shift” key) in subsequent models. From the instruction manual. Note the placement of upper and lower case keys. Later versions of the No. 2 feature more traditional shift buttons, though it is not clear (based on images I’ve seen) that the functionality of the keys is different. Do these machines lock in one mode or the other? And when did Remington introduce shift lock? Also, I would be curious to know who was the first to introduce upper and lower case typing. I’m guessing Remington, though perhaps some other manufacturer beat them to the punch. The keyboard on a later Remington Standard No. 2, featuring “Shift” and “Shift Lock” keys. This machine was lately offered on eBay. What is the “cylinder shifter” referred to in the instructions? Is it the lever in front of the typebasket, on the left? I think the idea is that that lever serves as a shift lock. Then you use the Lower Case key to type occasional lowercase letters. Yes, I think Remington was first with the two cases, introduced before the Caligraph, Hammond, and Crandall machines came on the scene. The “cylinder shifter” is indeed the lever on the left. In the down position, it moves the cylinder/platen forward (toward the operator) so that the lower-case typeface strikes the paper. In the up position, it moves the cylinder/platen backwards so that the upper-case typeface strikes the paper. Essentially, this appears to set a “default” mode — upper or lower case — according to the operator’s preference. In upper-case mode (as I am calling it), the “Lower Case” key temporarily shifts the cylinder/platen forward for lower-case typing, and then retracts. In lower-case mode, the “Upper Case” key temporarily shifts the cylinder/platen backwards for upper-case typing. Essentially, either key reverses the default setting while depressed. Both are attached by rods to the cylinder shifter. I will attempt to produce a video shortly, showing these movements. It appears the No. 2 shift mechanism represents an intermediate step in the development of upper- and lower-case typing. One other note: It is a little strange that directions for the case keys and the “shifting cylinder” are on different pages, 5 and 7 respectively, especially as one affects the other! Looking over images of other Remington standards, it appears that all employ the same shifting mechanism. 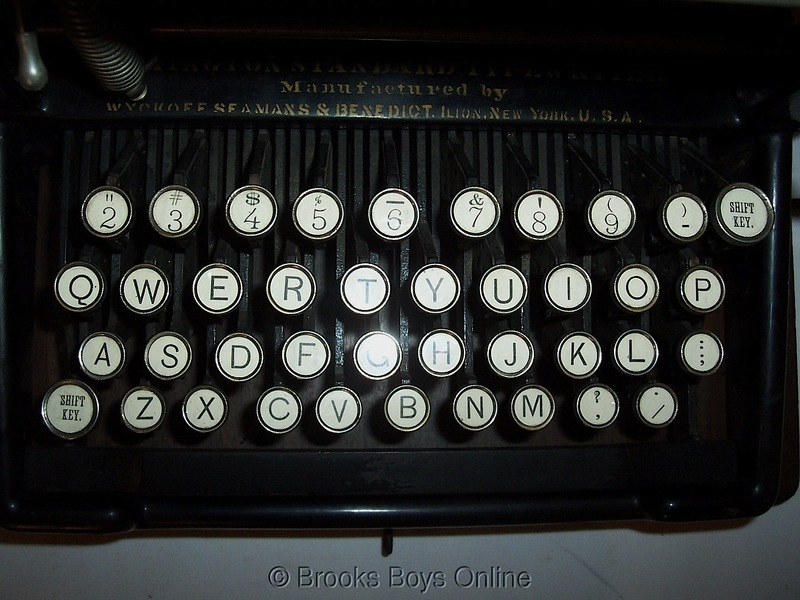 Only early 2s sport “Upper Case” and “Lower Case” keys. Subsequent models change the wording to “Shift Key” — sometimes offering only one key in the lower left corner. I’m curious to know when the traditional shift lock mechanism (a key, not a lever) was introduced.